Nathan Nobis, Ph.D. - Philosophy Professor and More: "Cultural Relativism" or "Moral Relativism" or "Ethical Relativism" or "Relativism"
"Cultural Relativism" or "Moral Relativism" or "Ethical Relativism" or "Relativism"
1. Think of some actions done in other cultures that you, or many of us, are likely to judge as morally wrong. Write and/or discuss: make a list of these topics. "Hey, that's their culture! That's their practice! That's their tradition! And so it's OK! They are OK with doing that in that culture, and so it is OK for them to do it, so you shouldn't judge, or think that what they are doing is wrong! It's their culture and so you should respect what they do!" Question: do people sometimes say things like this? When? About what topics (other than those that you listed above)? What else do they say along these lines? 3. If people say things like this, they might be accepting a moral theory that's often called "Cultural Relativism" or "Moral Relativism" or "Ethical Relativism." (But they might not!). If the majority of people in some society approve of doing some action, then that action is permissible in that society. If they disapprove, it's wrong. What makes an action wrong, in a society, according to this theory? If the majority of people disapprove of it. What makes an action permissible, says this view? If the majority of people approve, or don't disapprove of the action. A society's majority view or approval determines whether actions are wrong or not. This post or handout here is based on the understanding of Cultural Relativism that Rachels present, and many of their arguments. If people say "Hey, that's their culture! That's their practice! That's their tradition! And so it's OK!" and "They are OK with doing that in that culture, and so it is OK for them to do it, so you shouldn't judge, or think that what they are doing is wrong!" then they might be appealing to Cultural Relativism. They are saying that the majority of people in that society approve of some action and so it's OK for them to do that action, and so - since it's OK for them to do it - we shouldn't think that that they are doing is not OK. Given this, it's worthwhile to think more about the theory and whether we should think it's true or false and what, if anything, is good or bad about the theory and any related thoughts. 5. Why might someone think that Cultural Relativism is a false moral theory? Here are some arguments against Cultural relativism, some arguments to think that the view is false. If cultural relativism is true, then the majority's moral view in a society must always be correct. But the majority's moral view need not be correct. So cultural relativism is false. If cultural relativism is true, then we can find out whether an action is wrong or not simply by doing an opinion poll to find out what the majority thinks. But you don't find out that an action is wrong or not merely by an opinion poll: that only tells us what people think is wrong, not what really is wrong. If cultural relativism is true, then anyone who argues that any of the common, majority-accepted moral views of their society are wrong is always mistaken. But sometimes, people who argue that common, majority-accepted moral views of their society are wrong are correct. If cultural relativism is true, then there has been no moral progress in history, in the sense of worse views being replaced with better views (e.g., the view that slavery is not wrong being replaced by the view that slavery is always wrong) because those initial views weren't incorrect, according to cultural relativism, and so weren't in need of replacement or improvement. But there has been some moral progress, worse views replaced with better views. 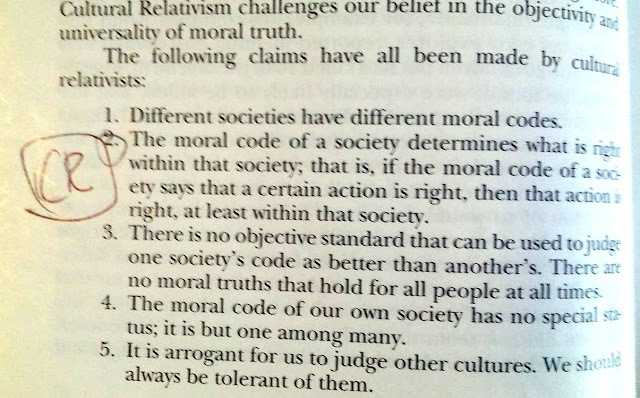 This argument can also be developed with some potential examples of cultural decline, if there are some ways in which society has overall come to accept objectively worse moral views: if cultural relativism is true, any change to a majority moral view always results in a change to a correct view, which isn't true. These are just a few arguments in support of thinking that the moral theory called "cultural relativism" is false. They can and should be explained in greater detail to better evaluate them. 6. Why might someone accept the moral theory Cultural Relativism? We should always be tolerant and respectful of everything that all other cultures do. This is a moral claim. According to Cultural Relativism, we should accept it only if the majority of people in our society accept it. But, at least in our society, this claim is rejected. Indeed, it's probably rejected in nearly all cultures! So, if accepting this claim inspires one to accept Cultural Relativism, accepting Cultural Relativism should lead one to reject it! If a society does something that is merely different, but not wrong, then we should tolerate and respect what they do. Sometimes we find different ways of doing things a bit "scary," and we mistakenly interpret that as "wrong." We need to get over that! Just because another culture has a different practice from us does not mean that what they are doing is wrong. If it is wrong, we can try to show that by appealing to Kantianism, or utilitarianism, or some other theory that proposes that what makes actions wrong or not is not merely whether we believe they are wrong or not. If a society does something that is different, but wrong, then we should not tolerate and respect what they do. Now, this doesn't always mean we should go actually go try to do something in that society to address the issue (but perhaps someone should, and someone else is in a better position to do so than us). But we can at least think that the action is wrong and express our disapproval of the action and why we think it shouldn't be done. Cultures (sometimes) disagree about what's moral and immoral. Indeed sometimes this claim is (mistakenly) called "Cultural Relativism," which is why I keep saying the moral theory called "Cultural Relativism." The claim here is just an observation, and a seemingly true one. Cultural Relativism is a moral theory, and a controversial one! How could this true observation support Cultural Relativism? Here I think we should focus on an aspect of Cultural Relativism that's a logical consequence of it, and think about that consequence as Cultural Relativism for a moment. This consequence is that there are no universal moral facts or truths: there's nothing that's just plain wrong, wherever you are in space or time, according to Cultural Relativism, since the moral facts depend on what culture you are part of: e.g., if you are in a culture that generally looks the other way when someone is victimized, it's OK to victimize someone in that culture. Therefore, there are no universal moral facts or truths: Cultural Relativism is true. If cultures disagree about a topic, then there are no universal facts or truths about that topic. This assumption is false: just because people disagree doesn't mean there is no fact of the matter. It might be that one party to the disagreement is just mistaken. For example, there was (and is!) disagreement about the shape of the earth. But the Earth is not round for some cultures and flat for other cultures. Some believe it's flat, but believing something to be true doesn't mean it is true. (If you merely believe you are a billionaire, that does not mean that you are, in fact, a billionaire). Many more examples make the point that disagreements don't prove a lack of universal facts or truths. 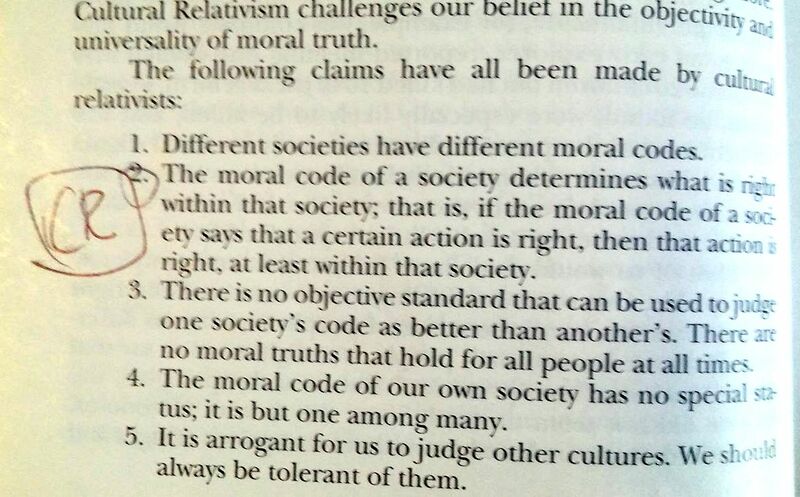 So this argument fails: it gives no good reason to accept the moral theory called Cultural Relativism. We have understood this theory and reviewed some arguments against it, that is, reasons to think the theory is false, as well as arguments in its favor, that is, reasons to accept the theory. On the basis of all that, what do you think of the theory? What do you think you should say or think if people say things like this? "Hey, that's their culture! That's their practice! That's their tradition! And so it's OK! They are OK with doing that in that culture, and so it is OK for them to do it, so you shouldn't judge, or think that what they are doing is wrong!" One possible basic response: "Look, just because some culture approves of some action doesn't make it not wrong. A culture could be mistaken, just as individual could be mistaken. So it's interesting (and maybe troubling!) that this culture approves of doing this ___, but that doesn't mean it's right to do that." People sometimes accuse each other of being Cultural Relativists. This is usually taken to be an insult, and the insults often fly along party lines. "These various actions (such as...) are actually not wrong, although there is a long tradition of them being mistakenly believed to be wrong. But they are not wrong, and so if people want to do them, that's OK, since they aren't doing wrong: people should be able to do actions that aren't wrong, if they want!" Understood this way, "liberals" clearly do not accept cultural relativism. They do not think that the majority is always right. "Conservatives" sometimes appeal to the Bible for moral guidance. The Bible, however, seems to contain some bad moral guidance concerning, among other things, say, inappropriate and excessive violence, to put it mildly. When "liberals" observe this advice, and so argue that the Bible isn't an infallible source of moral guidance, "conservatives" sometimes respond, "Well, that was the culture at the time; they were just following their own standards, and so what they did back then wasn't wrong, and so Biblical guidance is still always perfect." This sounds like an appeal to moral relativism. Greta Christina has developed this argument, and you should read what she has to say. 9. What's a Culture Anyway? Note: This discussion has assumed that we understand what cultures are. It would be worthwhile to think about what cultures are though, and which cultures each of us are members of. We probably are all members of many different cultures, all at the same time. These different cultures also probably also generally approve of different things: e.g., "college culture" might approve of doing X, whereas a religious culture might disapprove of doing X, and so on. In these cases, what is someone who is a member of both cultures (e.g., a religious college student) to do? Thinking through how we might answer this question might reveal even deeper problems for Cultural Relativism. Another note: Very different views are sometimes called "cultural relativism" so we need to be attentive to what people mean when they call something "relativism." Sometimes by "cultural relativism" people just mean that different societies have some different moral views. This view, of course, is true, but it's not the same as the moral theory called "cultural relativism" discussed above. Above, this view is seen as a premise in an argument for cultural relativism, the moral theory, which was argued to be an unsound argument. Also, social scientists (e.g., sociologists, anthropologists, psychologists, etc.) sometimes call "cultural relativism" the view that for the purposes of learning about a culture, we should "suspend" any moral judgments about the culture in the course of our investigation. This is likely a useful method: if, say, someone wanted to try to understand what causes some people to be attracted to, say, White Nationalism or the KKK, it might be most effective, for the moment, to set aside the moral judgment that these groups are evil. This is just a strategy for social science investigation, however, and the technique can be set aside after the research is done and our moral judgments are brought back into our thinking, e.g., "The KKK is a wicked organization, but new research gives us a better idea why some people are attracted to it, so now we are in a better position to intervene and lessen the chance that people will want to join hate groups and be part of that evil." The point is that this social science strategy is fully compatible with rejecting cultural relativism as a moral theory and thinking that some, many, actions are profoundly wrong in any and all cultures they occur.